It’s an old toy of a cylinder with evenly spaced slits on the side face and a series of pictures pasted inside. You can see the pictures being ‘animated’ by looking through the slits while rotating the cylinder. Basically, television and movie are also made by the same technique, but, this time, an artist realized a zoetrope in VR. The title is ‘MAILLOTS DE BAIN‘. I valued the unconventional challenge by this work. It not only broke the exisiting rule but also made me feel that the creator himself enjoys strangeness and what it brings to viewer’s sense of space and balance. He rated it high and it won the SILVER prize at this award. 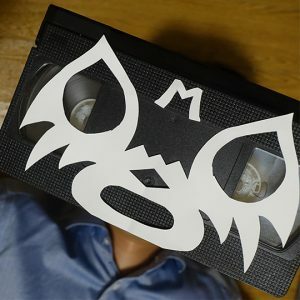 In this interview, I asked about the reasons why the creator, Mask du Video, came up with the idea of making a zoetrope in VR and why he rotated the view despite problematic VR-sickness being a hot topic nowadays. He has Master’s degree in Tokyo University of the Arts. He is currently working as a video producer. His real name is Hase. — Firstly, congratulations on winning the SILVER prize! How did you know about NEWVIEW? Mask du Video: Thank you very much for giving me such an honourable prize. And, I sincerely thank everyone who appreciated my work. I learnt about NEWVIEW via STYLY. When I was looking into how to create a VR space for my business, I happened to learn about STYLY and then got to know about NEWVIEW. Mask du Video: The biggest reason was that I found STYLY was a platform that allows people to create something in VR very easily. Although I was totally new to VR, I found STYLY allowed me to render things in VR easily with my existing knowledge and tool. So it’s so good that I wanted to make something with it. Immediately after I learnt about STYLY, I saw the advertisement for NEWVIEW, so I naturally decided to apply for it. Then, I looked into the application outline and found NEWVIEW invited a lot of famous people as its judges, held its workshop inside and outside Japan and published the instruction of the development environment such as Unity, to make the VR-creation community grow. So I was sure that this competition was looking for the quality of work seriously. Since I sensed it would make a turning point to start VR-art culture, I became motivated even more. In addition, the prize was also attractive. Of course, I wanted to win the prize money, but, the statement ‘the competition giving 2 million yen to the Grand Prix winner’ convinces even people who don’t know about art much, that this competition is a very serious one. So, one of my motives to apply for NEWVIEW was that it’s the competition to value myself as a creator when winning a prize. Maillots de bain from STYLY on Vimeo. — What concept is behind your ‘MAILLOTS DE BAIN’? Mask du Video: I aimed for the work that entertains even those who taste VR for the first time. When thinking of whom I would like to experience my VR work, what came in my mind was my family, friends and acquaintances in addition to the judges. However, most of them had never experienced with VR when I started creating ‘MAILLOTS DE BAIN‘. When I tasted VR for the first time, I found it difficult to find where to look at in 360-degree view or which way to go. Such a difficulty prevents people from appreciating the work fairly. The root of the concept is to adopt the expression suitable for the people who are not familiar with VR so that it doesn’t puzzle my family, friends and acquaintances. Therefore, when dividing ‘MAILLOTS DE BAIN’ into two parts, the first half gives a similar viewing experience no matter which direction you face at the start position and you can enjoy the change of the view no matter where you head for, so you will have a fun with the VR space even without any experience with VR. And, considering that you got used to a VR experience in the first part, the second part provides the experience to surprise and puzzle you. Since the second part has a trick to impress even people familiar with VR, all viewers can enjoy the work no matter how much experience they have with VR, I believe. Needless to say, the visual concept is ‘Zoetrope’. I sometimes see the article that tells the current situation around VR and art is still in a very early stage and I am also aware of it. When I thought about what visual is suitable for such an early stage, I found a hint from the history of film. Just like a film, VR is a media that uses pictures, so I thought it’s interesting to follow the history of film. That’s why I overlapped the oldest movie expression with the emerging new expression by using a zoetrope for VR. In addition, I chose Zoetrope as the key visual because it is one of the devices that make people understand the basic principles of movie at a glance. Speaking of the visuals, you will find a lot of kawaii girls in this work. This is because I adopt them as ‘Frontend’ to symbolize and express what is most suitable for the theme of this work ‘Backend and Frontend’ after thinking about how our world is constructed. In addition, I intended to adopt the expression nobody came up with before. This is the opportunity only in this early stage of VR history. So most of the expressions in VR should be still unexplored. It’s also interesting to claim that what you shaped out of your thought is the world’s first attempt. On the other hand, it’s a waste of this early opportunity to express something without deeper thought. So I thought about various expressions that were possible only in VR. Zoetrope got along this concept as well. In the real world, it’s almost impossible to view the zoetrope with the model or doll from the inside due to the structural reasons. But, in VR, people can easily view it from the inside because it doesn’t need any bars in the rotation mechanism to support the motor or the model. And, since the rotating model doesn’t have the mass, you can scale it up without any limitations. Taking advantage of it, I put a kawaii girl with a height of two ‘Gundams’ in this work. The direction to show the zoetrope from the inside is the result of the concept ‘Let’s suggest the new expression nobody came up with before!’. 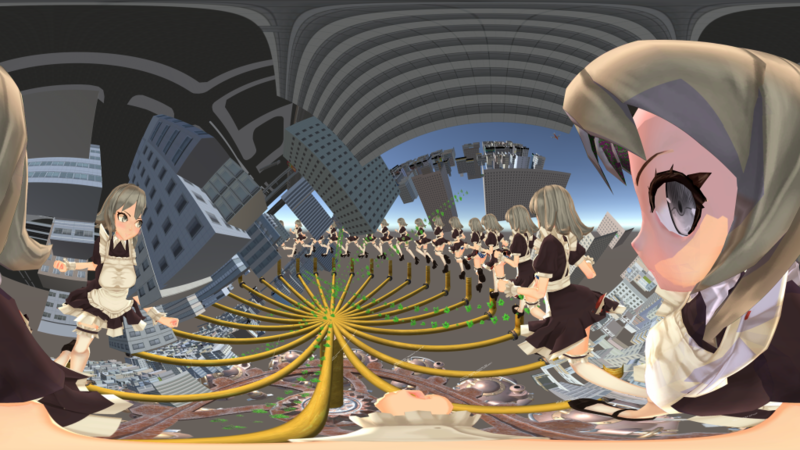 And I implemented a floating experience and the horizontally arranged credit roll as VR-specific expressions. — I see. Next, could you tell me how you created this work and how long it took? Mask du Video: I took a STYLY workshop in late June 2018. I actually started working on it since then. Since I learnt about the invitation to NEWVIEW, I was making the concept clearer by incubating the image and taking the notes of ideas for a month until I actually started creating the work. After taking the workshop, I noticed I couldn’t render my ideas without using Unity, so I quickly downloaded and started using it. I started touching Unity with a very optimistic view of completing my work just by placing and rotating objects. However, it actually took about two weeks to learn just basics to use Unity because I had to repeat try and error and, sometimes, suffered some setbacks. After that, it took a week to place the objects and add the animations. At this point, I only had about a week to the deadline, so I gave up the original plan to elaborate the work with decorative features and decided to finish it up so that it gives a primitive impression. I spent the remaining time adjusting the zoetrope to behave like a flip-book animation, then I submitted the work on the final day. — How did you prepare the character model? And, how did you realize zoetrope-like expression? Mask du Video: I got the character model from Unity Asset Store. That’s because it was the best choice given the quality achievable for the remaining time to the deadline. Firstly, I planned to pick up the character model from the collection of Google Poly. But, I couldn’t find the one suitable for the work. So I kept searching for it across several model-distribution sites and, finally, I found the one that convinced myself in Unity Asset Store and then bought it. One of the reasons why I chose it from Unity Asset Store was that I didn’t need to deal with the copyright issue, so I can use it with peace of mind. The Zoetrope in this VR space works on the same principle as a flip book. It has the same mechanism as the zoetrope displayed in GHIBLI Museum, Mitaka in Tokyo. In general, the zoetrope in museums is illuminated by a rapidly flashing strobe light to enhance the optical illusion, but, for this VR work, I didn’t apply such an effect or any other mechanisms except the rotating mechanism. The mechanism to animate is on the same principle as the one invented about 200 years ago. It is a simple task to make a zoetrope. 1. Prepare a series of 3D models transformed bit by bit. 2. Evenly arrange the 3D models on the circumference. 3. Combine all the 3D models into one Game object. 4. Rotate it by the Animation function. It makes a zoetrope-like effect. The optimum RPM depends on the frame rate, so you need to adjust it according to the development environment, I think. — I can see that this VR world consists of three layers that are difficult to see in the first-person view (In fact, the characters have been placed below the ground surface). Could you tell me why you adopted this kind of design? Mask du Video: I believe one of the beauties of art is that people can interpret it in their own way. I created this work to encourage each viewer to widen the range of interpretation. To interpret an art work, you need a certain length of dialogue with it, in other words, the time to contact with it. To make the viewer spend more time contacting with the work, I think it’s helpful to arrange a psychological ‘hook’ that attracts the viewer’s attention. The three-layer structure helped me to set a psychological ‘hook’ to make people spend more time viewing the work, giving an impression ‘Something is at my feet. What’s this?’. However, it’s rude to viewers that I place a meaningless hook ‘meaningfully’ and just leave its interpretation to viewers. So I gave meaning to every placed object and structure. As seen in the description of the work when I published the work, ‘MAILLOTS DE BAIN‘ renders the situation where ‘Backend’ and ‘Frontend’ working together to run the society. This multi-layer structure came from the idea I adopted to symbolize that theme. This vertical three-layer structure was adopted to express the distance by inserting a layer between the top and bottom layer. You often see that two things have the relation like both wheels of a car but there is a psychological distance between them due to the difference of their circumstances and positions. For example, it’s the case for a technical job and sales job in a company. The work became a three-layer structure to render such a distance in an explicit manner. In addition, I gave the middle layer a role like a stage wing. 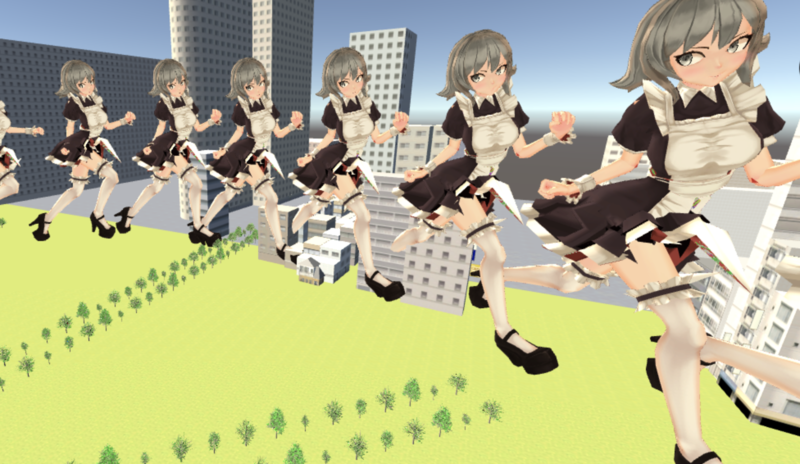 As the people who viewed the work already noticed, some of the buildings and the kawaii girls are stored in the middle layer. It helped me to give an interesting visual like a mechanical clock to the whole VR space. And, it also expresses the changing distance between ‘Backend’ and ‘Frontend’. It means that the relationship between people is not consistent even within a group. Then I set the viewer in the top layer of the three-layer structure and show the world rotating and express the part of the world we usually see. In the past, when IT technology was not developed yet, the global trend was only visible superficially. But, after the spread of the Internet, we came to catch a glimpse of the hidden side, or ‘Backend’. In the second half of the work, I showed the visible range of our modern life that can catch a glimpse of the mechanism of ‘Backend’. I can say this three-layer structure, which is hard to see from the first-person view, is the result of a good combination of the creative theme and the hook for viewers. Although I did my best to answer the question like this, I am still happy as long as people interpret the work as they like. I am even happier if it’s accepted positively. It’s my pleasure that the viewers intuitively judge whether they like it, whether it’s interesting, whether it’s acceptable and etc. to value the work in their own way. — Could you tell about the equipment and tools actually used? Mask du Video: I used MacBook Pro (2016) and Unity. Although it’s not the PC I originally planned to create VR work with, I managed to use it somehow. And, I was working with a trackpad below the keyboard, which made my fingers cramped. So I bought a trackball-type mouse to continue the work. In addition, I didn’t use HMD until I completed the work. Rather than checking the work with HMD while creating it, it’s fun to come up with more creative ways by imagining various things and adopting a lot of ideas without knowing the actual state. I also avoided getting used to my work too much by not checking it frequently during the creation. However, in fact, it was a gamble. I was rather relieved than impressed when I saw my work at the gallery in Shibuya. I am glad to see the work was completed as I intended. For the next time, I create my work while checking frequently with HMD. — Thank you. Could you tell me about what you cared about most and the difficult points when creating this work? Mask du Video: I told what I cared about most is when I talked about the concept, so could I talk about another point I cared about? Firstly, another point I cared about is to make something like a staff roll of movie, that is, engraving the name of the people involved, on this VR work. The copyright information is reflected on STYLY immediately when you use the object via Google Poly. However, for this work, I entered it manually because I wanted to put the names in the work itself. In addition, I also showed my wish to have an equal relationship with the people involved although I am responsible for this work. Then, I thought VR could make it possible to create a staff roll that makes the names of the involved people aligned horizontally, so I adopted it for the work. 2D media such as film, naturally defines a hierarchy by the display order or how the names are aligned, but VR is not 2D. By arranging all the name of the people involved on the circumference, you can make a mechanism so that the viewers can see all the names of involved people from anywhere as long as they keep looking for a certain period of time. In this work, although they are only visible on 2D screen of the web browser, you can see the name of the people and the organization involved into this work, which follows the robot in the lowest layer. 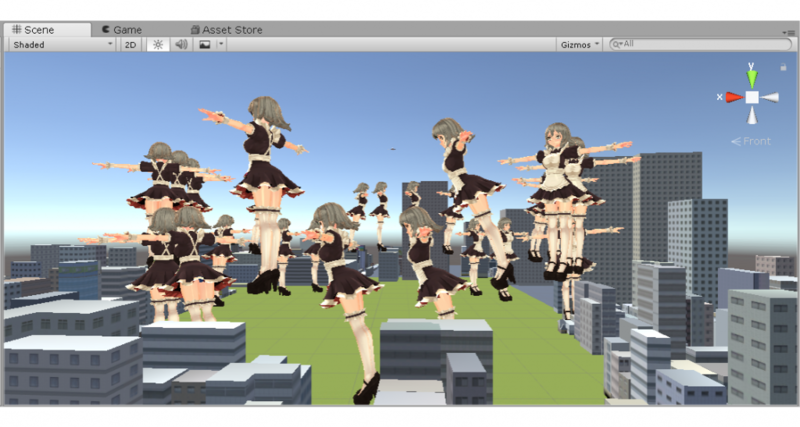 The most difficult point was to arrange the kawaii-girl models neatly. The people with technical knowledge would think that the model could be arranged neatly by entering the coordinates keeping a constant distance from the centre and constant gaps between the models. 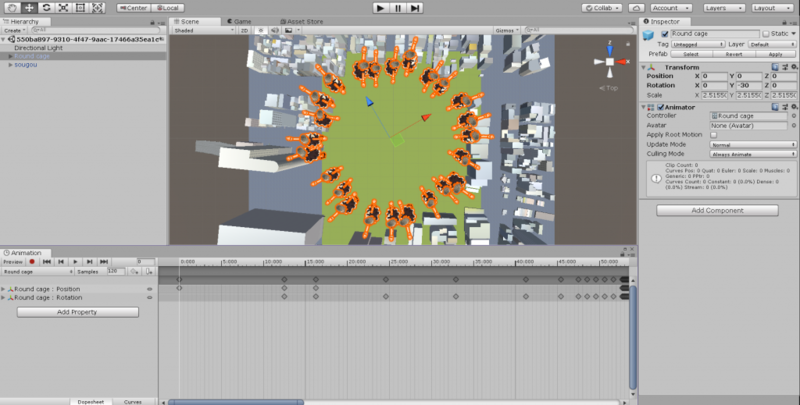 But, I arranged the model by my eyes while orbiting the Scene view (The workspace window) in Unity. It’s a very painful task actually. I had a reason why I took this painful path. When entering the coordinates of the models, they aligned precisely in the Scene view but they were displayed differently in the Game view (the window to check the behaviour) showing a random alignment. So, due to this problem, I couldn’t make the zoetrope work when rotating it. I tried various ways such as checking the parent-child link between the objects, unlink the prefabs, but I couldn’t manage to solve it. Finally, I solved the problem by placing the models ‘irregularly’ in the Scene view so that they look aligned in the Game view, which wouldn’t be the solution useful for other cases. — Finally, please tell me about your future plan. 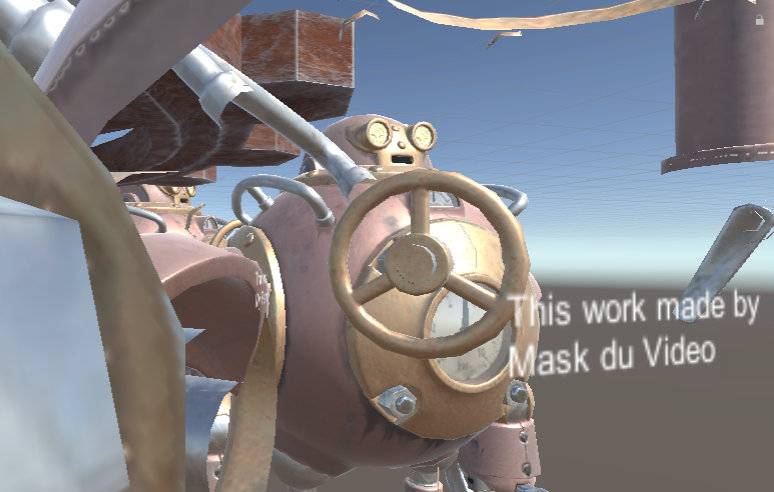 Mask du Video: I am now working on the prototype of a VR-type educational content. In this project, I am looking into where people who are not good at studying have a setback and how VR can improve the instruction to solve it. As a creator activity, I accumulate the ideas for the next work. When creating this VR work, I realized that a technical idea was interesting and easy to be rated high, but it’s not all that is demanded. A lot of people focused on the idea for the expressions even with just basic techniques used, which was one of the reasons why my work was rated high at NEWVIEW on my understanding. And, by being valued in this competition, I realized that one of my strong points was to create a simple and expression-oriented work, so I am thinking out the ideas along this direction (Of course, I also catch up with the technologies that are updated continuously). As I have a lot of ideas, I really want to shape them. But, I am patiently polishing up them on paper. When I shape the idea that was not elaborated fully, I am usually satisfied with it so that I can’t develop the idea further. So I am focusing on the preparation for now. Having said that, I have already got the outline of the idea ready so that I can start working on it even today if the deadline for the next NEWVIEW award is announced. The art field of VR is still in very early stage. I am sure there is no right answer for the expression in VR yet. That’s is why people should challenge everything without following the current opinion about what 3D expression should be, to lead to the expression of the next generation. I would like artists to taste what they can enjoy only in this early stage by all means.